Hey, I like how you gave Wiglaf and Mordred a variety of different expressions in all the panels. The diversity in their expressions really makes their dialogue come alive. Wiglaf effortlessly catching the arrow in panel 3 is a great one. 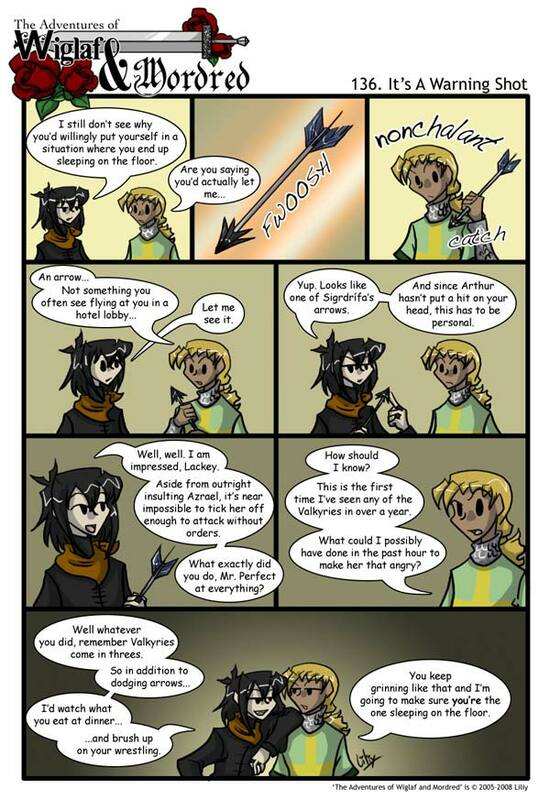 And I agree, Mordred looks awesomely snide in the last panel. :cool: His grin and body language communicate craftiness and sarcasm. Mordred must be quite happy because he will get even more entertainment out of this trip than he expected, watching Wiglaf avoid assassination attempts. Hmm. So Sigrdrifa is of the imperial school; allowing her enemy a chance to surrender with a shot across the bow means she has more ruth than I credited to her. Hurrah for classic Wiglaf and Mordred! And nice continuity from the conversation in the previous strip. Like Blackford said, the focus on expressions conveys the emotions behind the remarks very well. It’s been a while since Mordred has been this evilly interested in something. How many months since he cut Wiglaf’s hair? And I forgot to mention that that’s a nifty arrow in panel 2. What culture created those? Yay for classic Wiglaf and Mordred. :happy: It’s been a while since it’s been just these two, I kinda missed it. with that line alone a small gaggle of fangirls just died of overload you realize this right?